• Features sharp strong cutting edges for precision cuts and long lasting use. It’s important to have the right tools for any task. We know that having dependable, high quality scissors on hand makes your job that little bit easier. Medicare has a selection of medical scissors for every task from wound dressing with dressing scissors and bandage scissors to emergency use Tuff Cut Shears. Medicare scissors are premium quality medical grade 100% stainless steel and are used by first-aiders, paramedics and other medical personnel. Medicare medical scissors can be sterilized for further use. 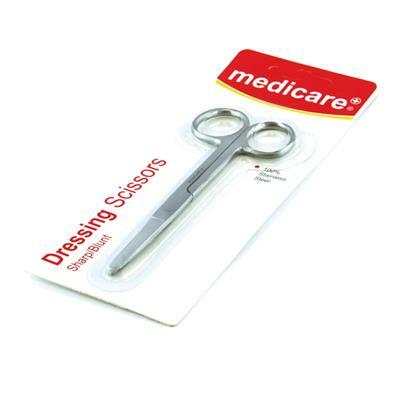 These Medicare Dressing Scissors are Sharp/Sharp and suitable for use as a general scissor, used to cut small to medium wound dressings and many general purpose tasks. Supplied in an easy to open, sterile pack.